The Order of Knighthood is an appendent organization of Older DeMolays. The Knighthood program is for active DeMolays between 17 and 21 years of age who are organized into a subordinate unit known as a Priory with its own officers and ritual. The Order of Knighthood made its debut in 1946, when it’s ritual was exemplified before the Grand Council, now known as DeMolay International’s Supreme Council. Through the years, the activities of the Knights have consisted of social and educational programs geared to older DeMolays, with a special emphasis on career planning and coed activities. The official name of the order of Knighthood is the Chivalric Knights of the Holy Order of the Fellow Soldiers of Jacques DeMolay. It is not an honorary degree or award, but a working body whose purpose is to extend fellowship and serve the Order of DeMolay. 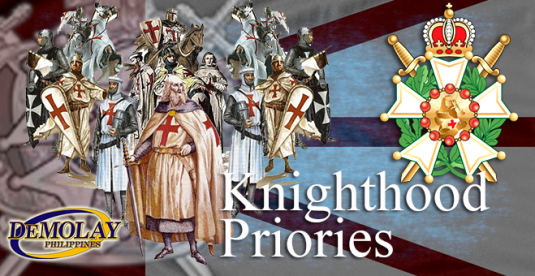 To encourage greater efficiency and progress in a Priory’s program, the Past Illustrious Knight Commander Meritorious Service Award was established. If you are interested in organizing a Priory, contact your Executive Officer for guidelines in your jurisdiction.